Peace Corps Volunteer. Peru 2018-2020. CED. This week I learned when my host family has an emergency we have a pollada. Our pollada included papas, pollo, ensalada, limon, y ají – an oil-fried 1/4 chicken, potatoes, a lime-based salad dressing for the sliced cabbage (what is called salad), and María’s “aspirante-famous” hot sauce made from rocoto (Andean chili pepper.) One hefty to-go plate cost 12 soles, about four U.S. dollars. The funds raised go toward hospital tests for Vidal, Maria’s husband and the family patriarch, who was admitted Wednesday for severe spinal pain. Maria started preparing on Thursday for our 4am start on Saturday. It is Sunday afternoon. We just finished. I estimate, over the course of two days, a collective rotation of 15-20 people (family, neighbors, and friends) were picking up, hanging out, and pitching-in, making close to 200 polladas. My inclination (as an introvert, an empath, or United State-ese?) is to give the family space and privacy. (Question: Wouldn’t you?) I cross-checked my assumptions with some widely seeded questions to people a ring outside of the inner family circle, also checking my own personal discomfort: I already lost two parents. I don’t need to be present for this. I don’t understand anything anyway. No one tells me anything. They don’t want me here anyway. I leave next week. I am just in the way. Turns out in Perú you get to parachute right smack into the center of all the business for as long as you can. The important thing is showing up. Notice how I used “we”? It only took eleven weeks and news no one is ever prepared for, no matter how much practice. One thing I do know is that I am pretty good holding center a crisis. It was a great weekend of laughing, crying, cooking, crying, laughing, hugging, and so much damn cabbage. Even the hijas called me hija. Thursday is going to be tough. There go my plans for my 43rd birthday, dammit. Perhaps the most bloggedy update was our final Language Proficiency Interview (LPI) on Thursday. In order to swear-in, all trainees need to be at level Intermediate-Mid. I started at Beginner (Sub)-Mid. (Thanks 12 years of French, 22 years ago!) The exceptional PC Perú language team dragged me like a blindfolded, three-legged race partner up three levels to qualify for service. Unofficially, I heard everyone in Peru 31 passed. Officially, I am waiting to hear tomorrow. Oh yeah. (G)od showed up a lot this week. Fun, that. For one language and diversity class we were presented native plants and their medicinal uses, as well as a few brief introductions to indigenous ceremonies. 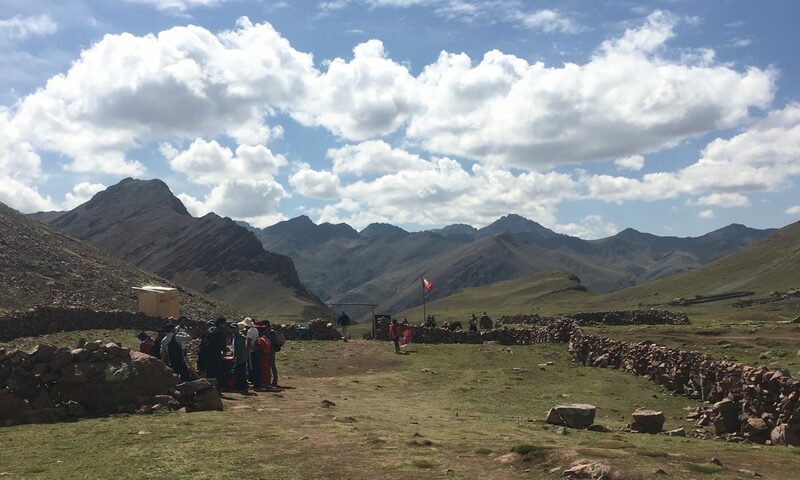 We gathered as a whole Peru 31 group and had a ceremony to the sky / closing of the light and buried ceremonial coca leaves (holding our wishes for the future) to grow. A visiting current volunteer shared the importance of having her faith and religion during a challenging two years of service. It wasn’t a message of conversion, or higher-than-thous, it was a gentle mention of one of many personal tricks to maintaining a commitment of service with the Peace Corps. Later that day I caught a glimpse of her leading a prayer circle with a small group of trainees and was touched by her welcome. Friday, I found myself in my own prayer party by quietly minding my very polite and social business on our family’s living room couch. That turned into a power circle of other host moms and neighbors in a very long, very Spanish Catholic rosary prayer circle, for Maria, her family, and Vidal. Mid-Señor de Los Milagros, a scorpion “strolled” (as they do) out to the middle of the circle and paused in the center. As the praying hands (human) formed a circle of pointed fingers (human) at our apparition (scorpion) I waited for someone to announce The Message. The punchline. The coming. Instead, we got a prompt single applause from a flip-flop. So why all the God / Spirit / Cosmos / Higher Self / Grief stuff? I dunno. It is Week 11. I am worn down. I am raw and saying No and being okay with it. I am even saying Yes and being okay with it. I am also just making it to June 7. UP NEXT: This Thursday, 46 remaining Peru 31 trainees will decide whether or not to swear-in for two years of service. Fast friends are having farewell meals and toasts, writing thank you yearbook notes, and preparing host family goodbyes. When I look back on how frustrating, alienating, isolating, infantile, hilarious, warming, surprising, WTF, LOLz, and once-in-a-rare-moment- deeply moving – the past three months of training have been, I think it took the pollada for me to go all in. If it takes two years to have one moment worth it? I am going to give it my best shot and see what is next. After all, what good am I if not at holding center. I am glad you are staying-you have challenged yourself to do so many things that are difficult for you and you’ve done them. More will come, they always do, but you can and will succeed and make a difference to those who know you. Super proud of you, dear one. Proud to know you, my friend. Seriously awesome Jess. You are a force. So happy for you and for the people whose lives you will impact. The challenges are sure to keep coming, but struggle deepens our appreciation, perspectives, feelings of enlightenment… however that may look, right? Savour the WILD. I am deeply admiring the path you are on, xo.